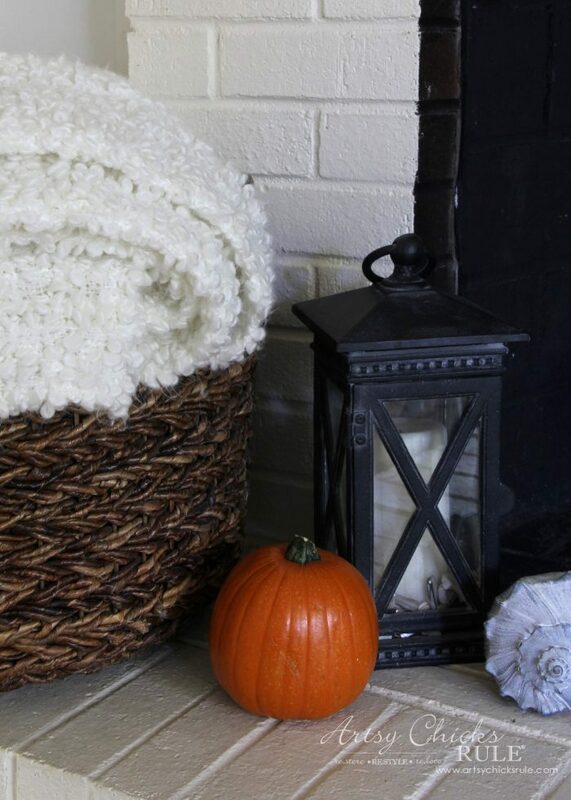 A traditional fall home tour which includes lots of orange touches along with creams & blues, too. Since I live by the coast, you may even find a coastal touch or two. Hello friends! 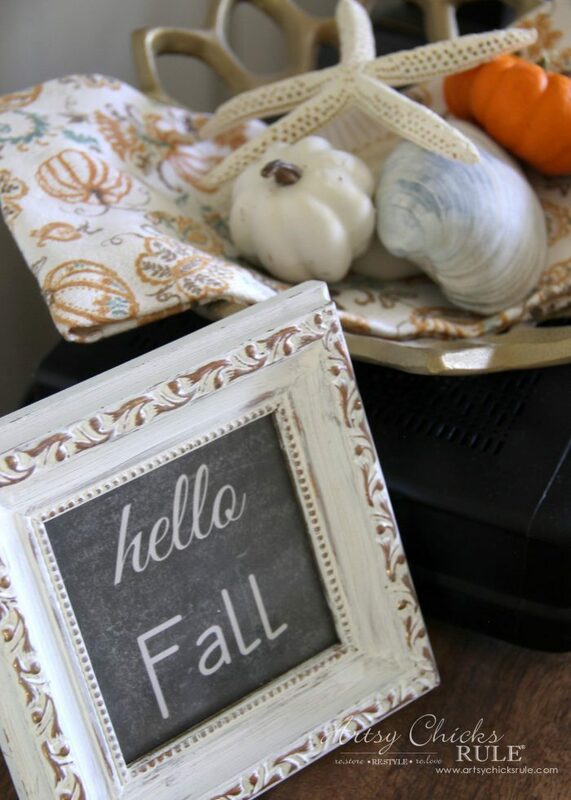 I’m so thrilled to be joining the “Welcome Home Fall Tour” and sharing my traditional fall home with you today. Thanks so much to Kristi at Chatfield Court for organizing the tour this week. If you are coming over from Kristin’s place, My Uncommon Slice of Surburbia, welcome! 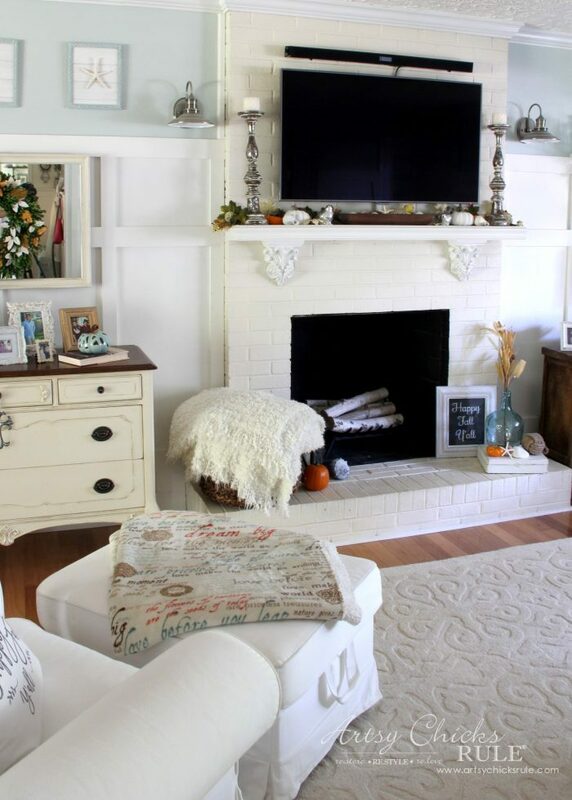 My traditional fall home tour that I’m sharing today is my family room. I decided to add a bit of orange in this year. 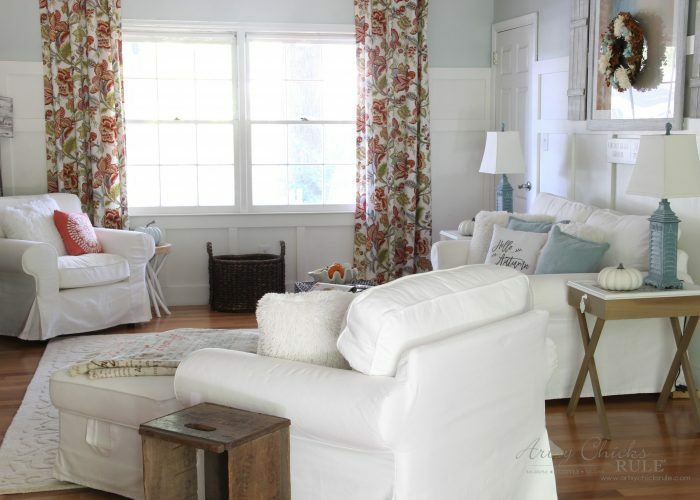 I love the diy no-sew curtains I made for my family room with it’s oranges, corals, blues and even a small touch of red, against the blue wall color and other blues I have in the room and thought a bit of orange might be really fun. 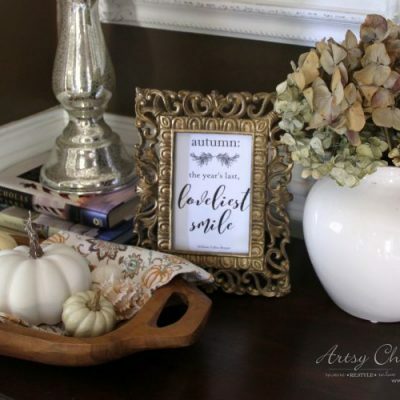 I usually keep my fall decor fairly neutral as you can see in this decorated fall foyer post and fall tablescape from year’s past. But I have to tell ya, I’m loving the fun pop of orange in here this year! Even my Better Homes and Gardens throw has those colors in it. Orange is such a strong color, all you need is a touch. Little bits here and there. You might see I left a few seashells and starfish around. 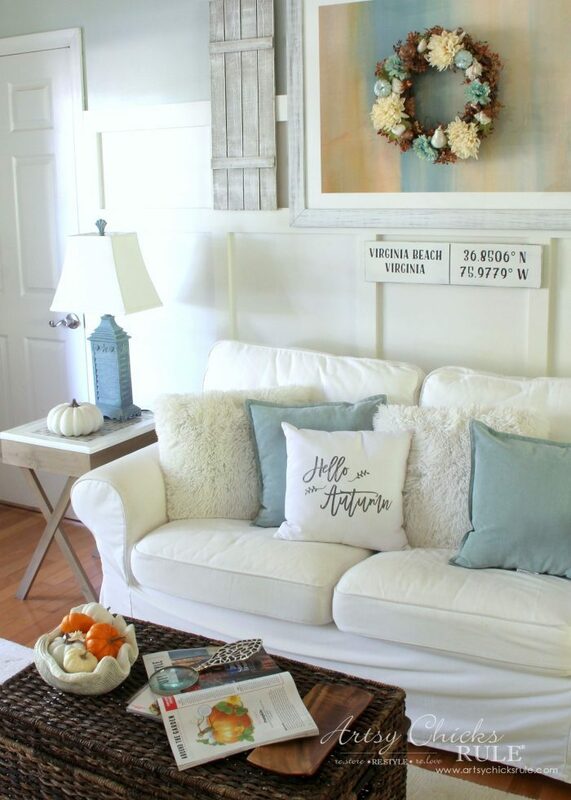 My home is always decorated in a “summery” way because I live in a very coastal area right by the ocean. 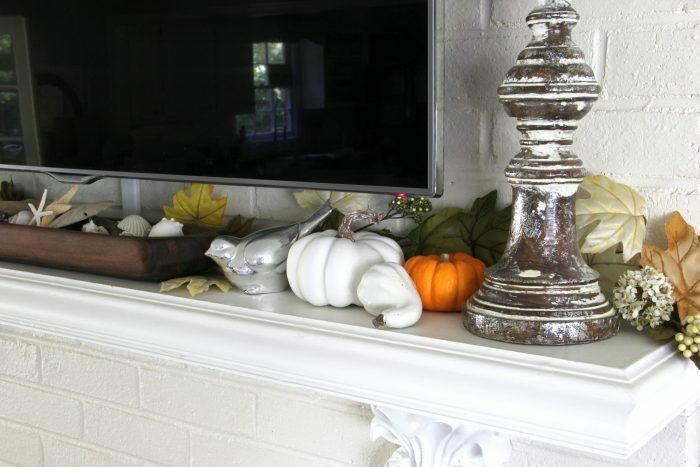 But I pulled apart the leaves from a few autumn colored faux arrangements and layered them up and around the mantel. 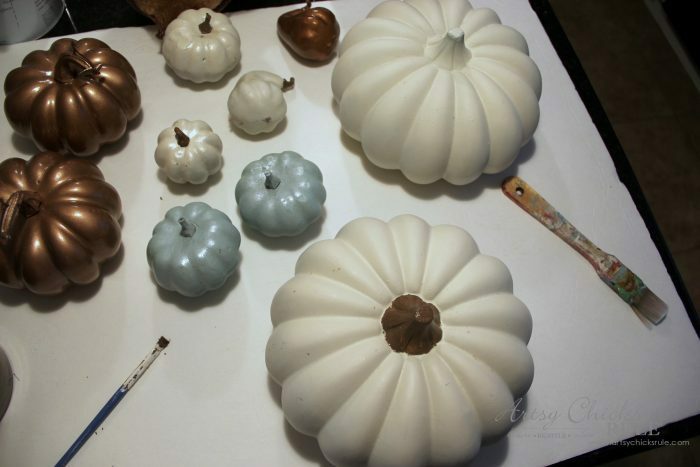 And remember the faux pumpkins from years past that I recently painted (again)? They all got new life and a brand new look. This is actually a baking pumpkin that I picked up at the grocery store. 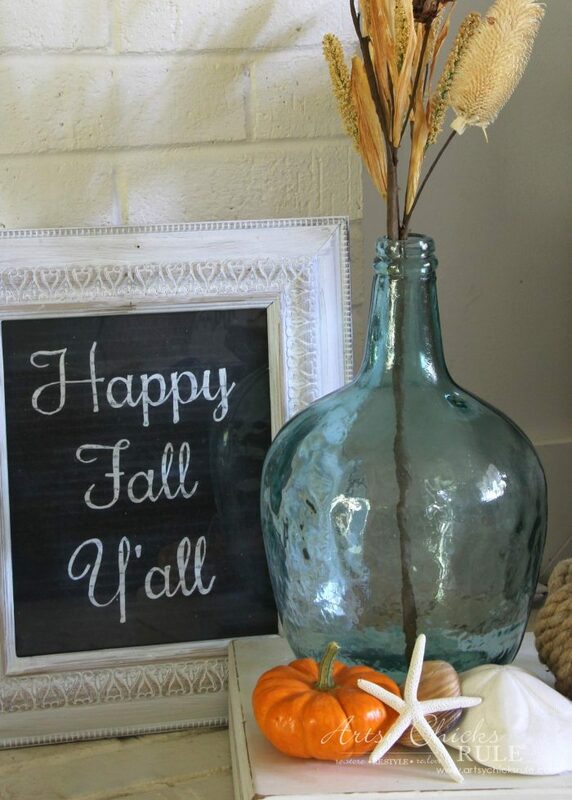 For this little vignette, I simply added a small orange pumpkin, some dried stalks in the blue jar and this “chalkboard” sign I made some years back. 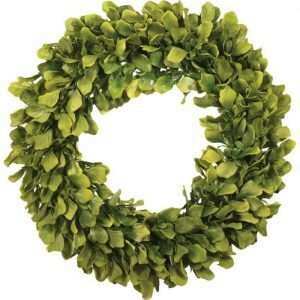 Remember how I added berries to this dried boxwood wreath for Christmas? Well, for fall I added white and yellow/orange leaves. I just poke em in and that’s it! No glue as I want them to come right back out when I’m done with this seasonal decor. 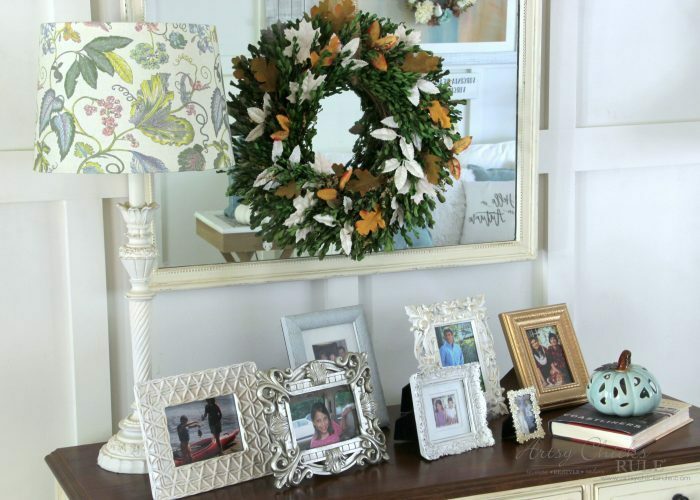 It’s a great way to change up your decor without having to change out wreaths. 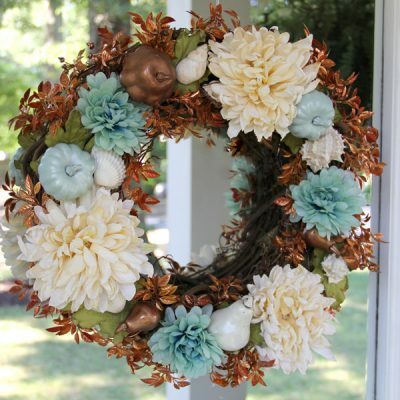 And the wreath hanging here was the coastal fall wreath I made last year. The pillow is one of two I also made last year. 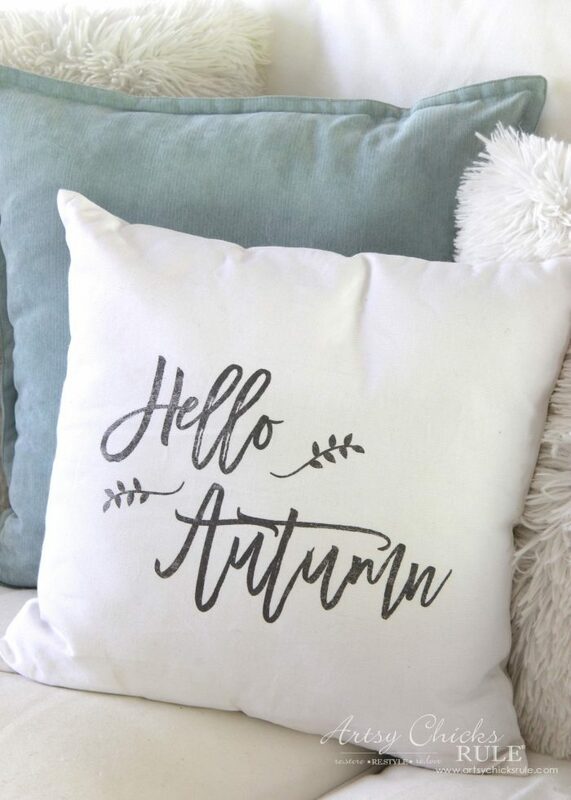 You can find them here, DIY fall pillows. I just added a few faux and real, small pumpkins in my shell dish. These were orange pumpkins from the thrift store. 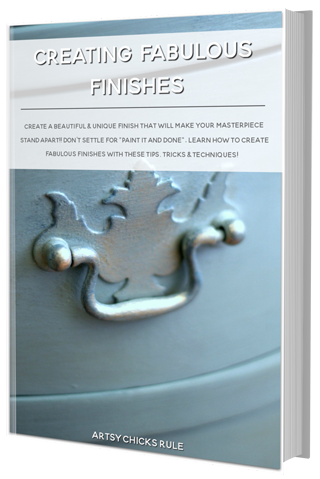 You can check em out “before” here. I painted them white to use in a tablescape previously and this year I gave them more realistic looking brown stems. I have one on each side table. 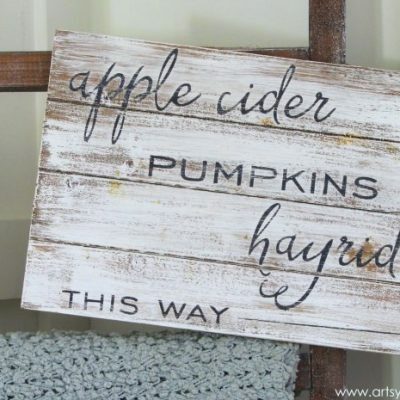 This is the apple cider, pumpkins and hayrides sign I made and shared with y’all recently. 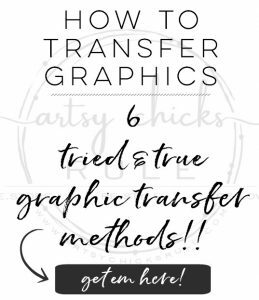 Quick little trick to make your black and white printed “chalkboard” printable look like an actual chalkboard? This was also part of my coastal tablescape I linked earlier above. When I saw this print at Kirkland’s I knew I had to have it. It, along with my curtains, were actually my inspiration for my traditional fall home tour this year. I pulled this pumkin out of the garage from many years past. Believe it or not, it was a sparkly, deep red pumpkin! 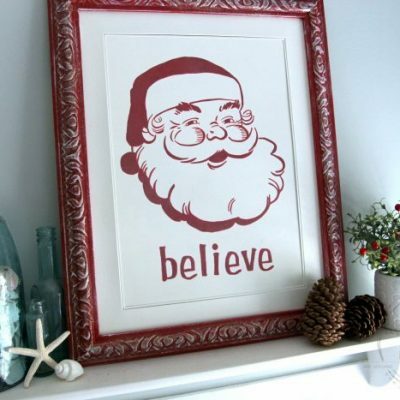 I wish I’d taken a photo to show you but I just get busy decorating (and painting!) and forget. And here is the other chair in the room with the other pillow I made last year. And here is a view from the back screened porch looking into our traditional fall home tour…in the family room. I love this time of year because I can keep those doors open. They are glass french doors but it’s amazing how much more light comes in with them open. Not to mention, I love the cool breeze and being able to hear the birds chirping. 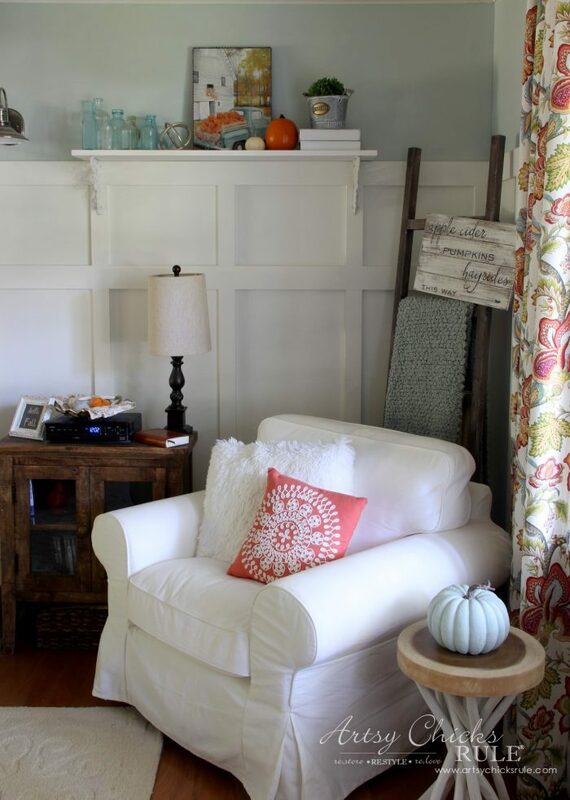 These were all pretty simple (and thrifty) additions/changes to create a fun, fall room. 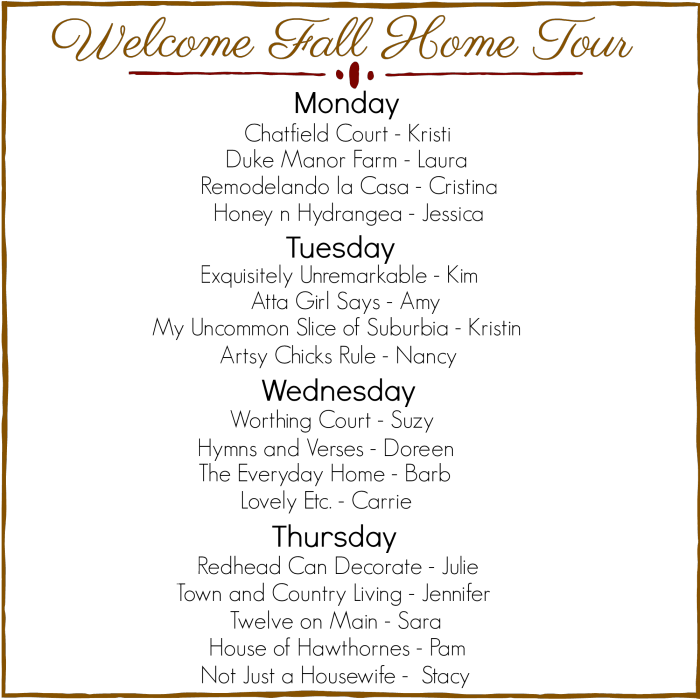 The next stop on the Welcome Home Fall Tour is >>> Suzy at Worthing Court. Like this? Pin it to save it! Here are the other tours from yesterday and today, hop on over and see them all! 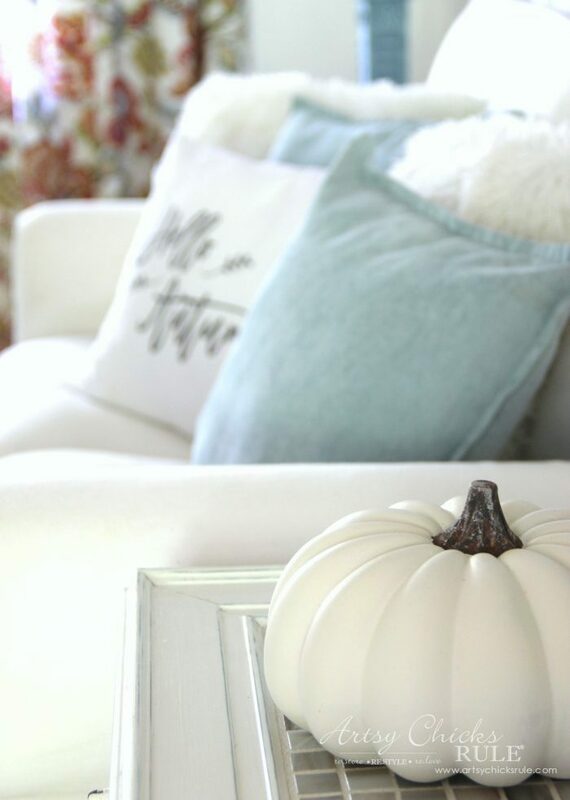 So many pretty fall touches, love the combo of the blue and orange. 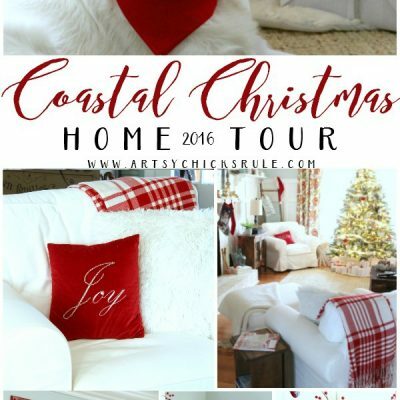 As a beach dweller myself, I love all of your coastal touches. Fall is a great time at the beach! Happy hopping! Blue and orange are so pretty together! 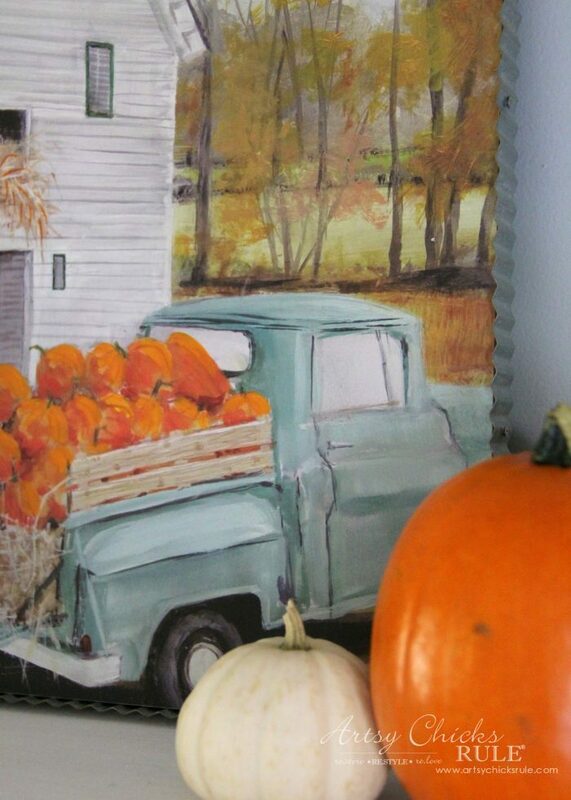 I love that art of the aqua truck with pumpkins. 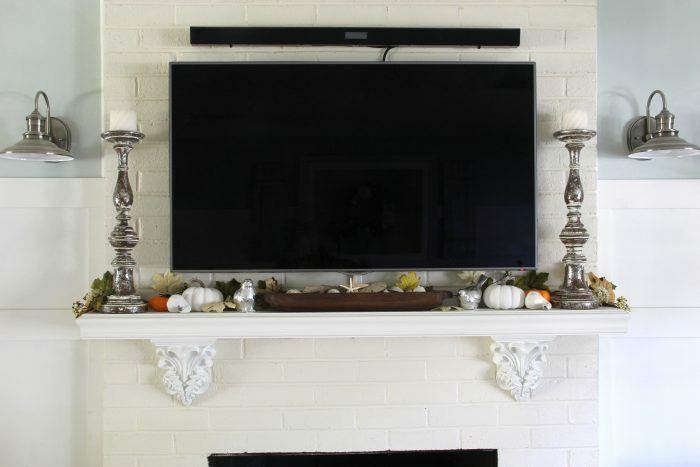 Your family room looks great. Fall perfection!!! Very nice! I too love the blue and orange touches! 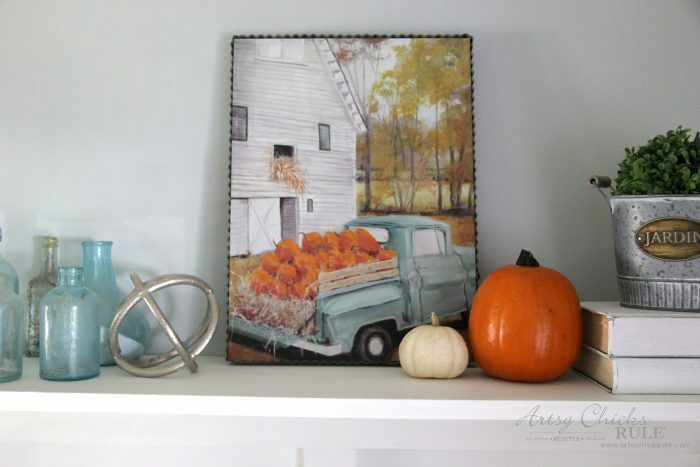 I love the truck with pumpkin canvas and tried to find it online at Kirklands but no luck. I am hoping my local store has it. Thanks for sharing! Those gorgeous curtains caught my eye right away, so very pretty! 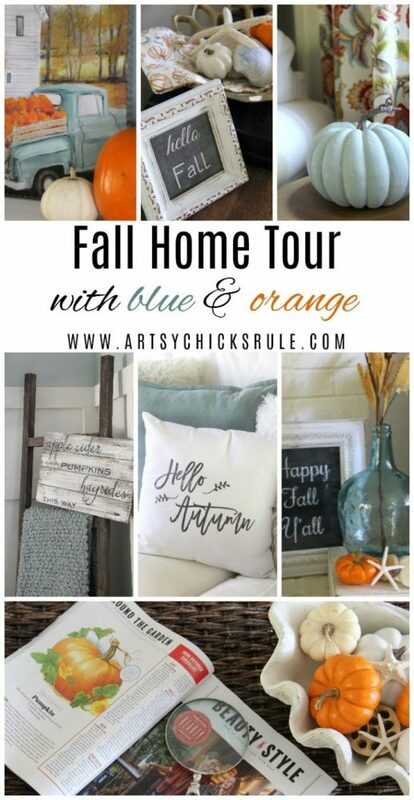 Love your home decorated for fall with the beautiful mixes of blue and orange! I love this! The white with pops of color. 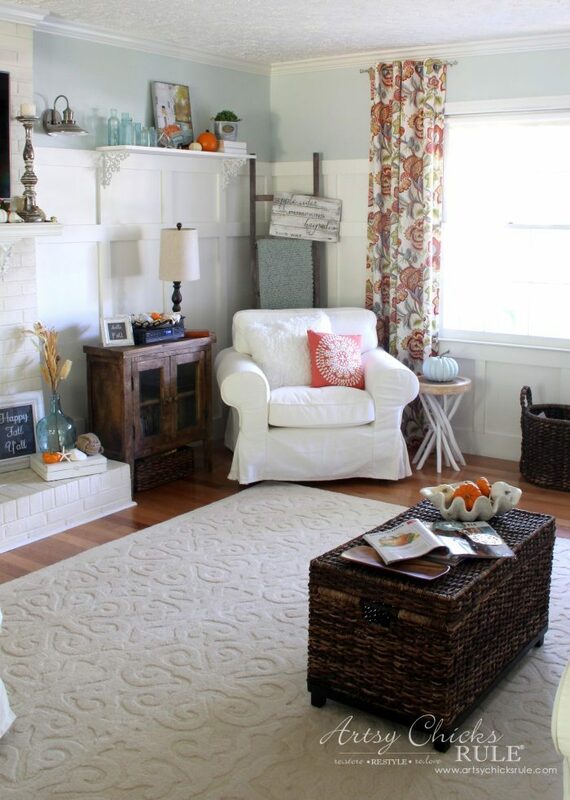 Where did the white cream rug come from? If you don’t mind me asking. Beautiful room, Nancy! 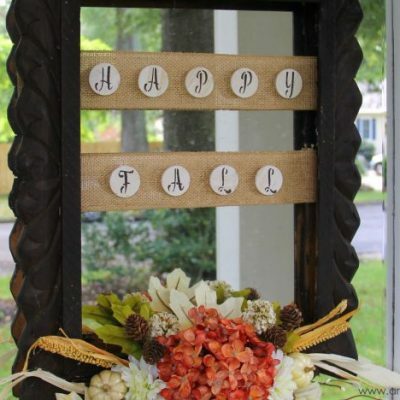 I love all of your handmade DIY fall touches that you decorated your room with. Love the inspiration print that you added too. So cool! Thank you for being a part of the Welcome Fall Home Tour. 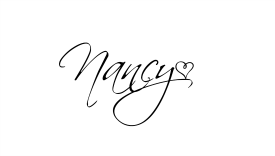 So pretty, Nancy! 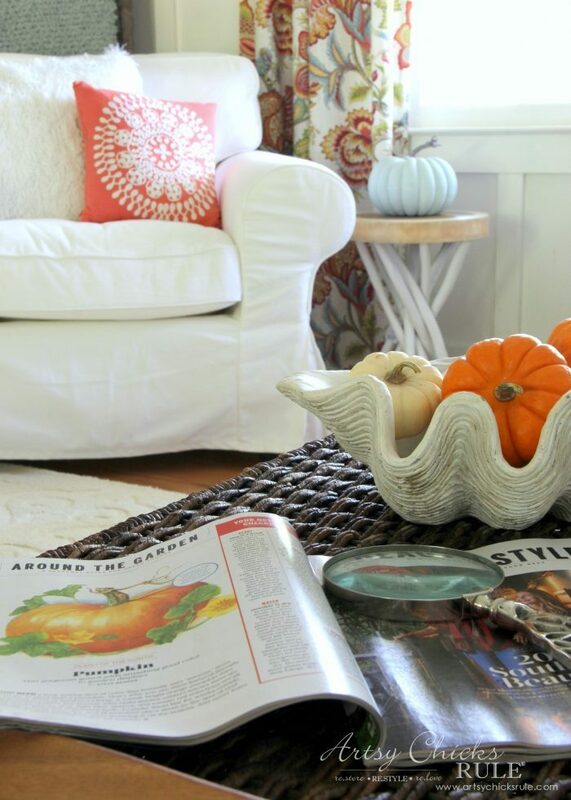 You’ve done a great job of incorporating your coastal touches with fall decor. Love every single thing! Nancy, I love those colorful curtains and the print from Kirkland’s is just adorable and perfect for the season! Oh, that inspiration print says Fall out loud. LOVE it! 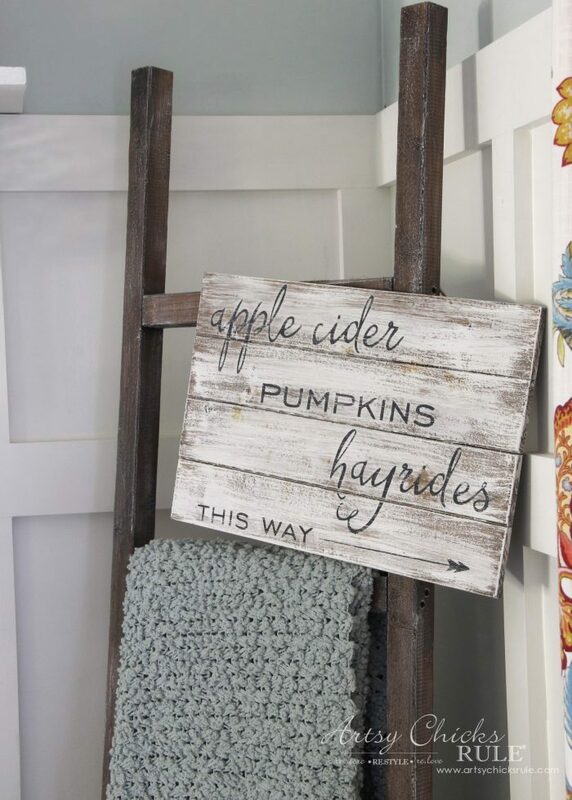 What a perfect staring point for your beautiful Fall decor. Love the blue/orange combo. 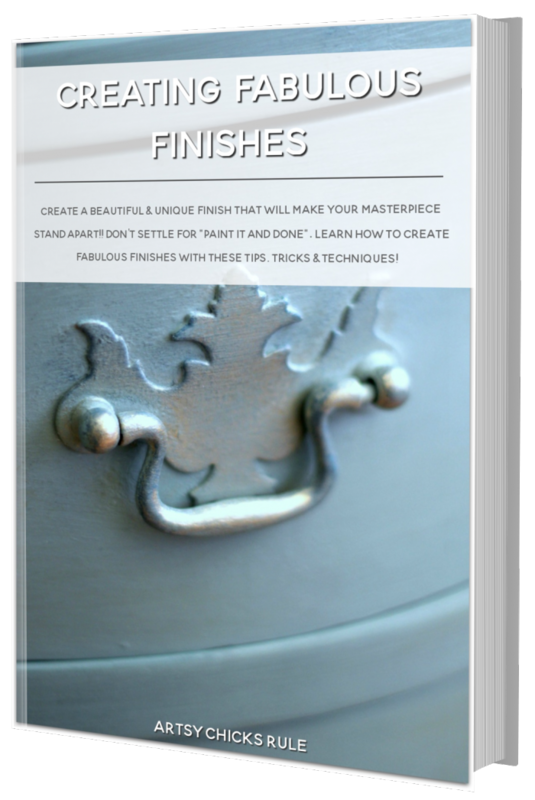 Since they are complimentary colors, they always look good together, any blue and its complimentary orange – from navy and deep rusty orange to the beautiful soft blue and orange you used. I too am a lover of things coastal (though I don’t live anywhere near the ocean) and have a very large collection of shells and shorebirds. 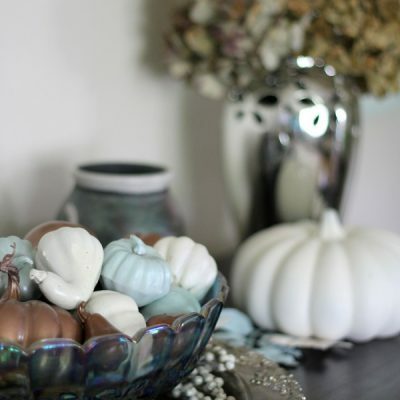 You have certainly given me some inspired ideas on how to work those shells into a fall decor scheme. 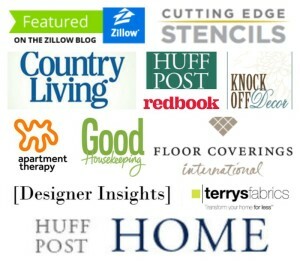 I so enjoyed your Fall Home Tour, thanks for sharing the results of your creativity! Warm and inviting and so very pretty! Your blue and orange look great together. 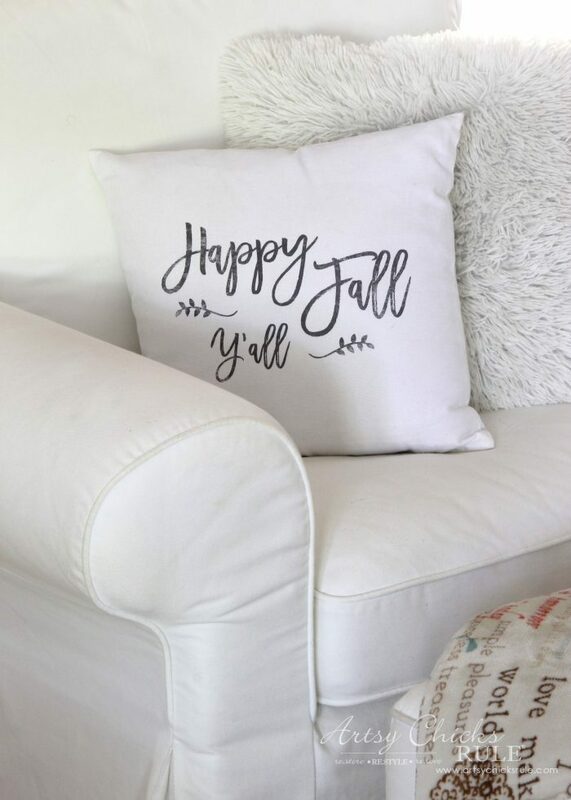 I love using white and neutral fall colors as well! 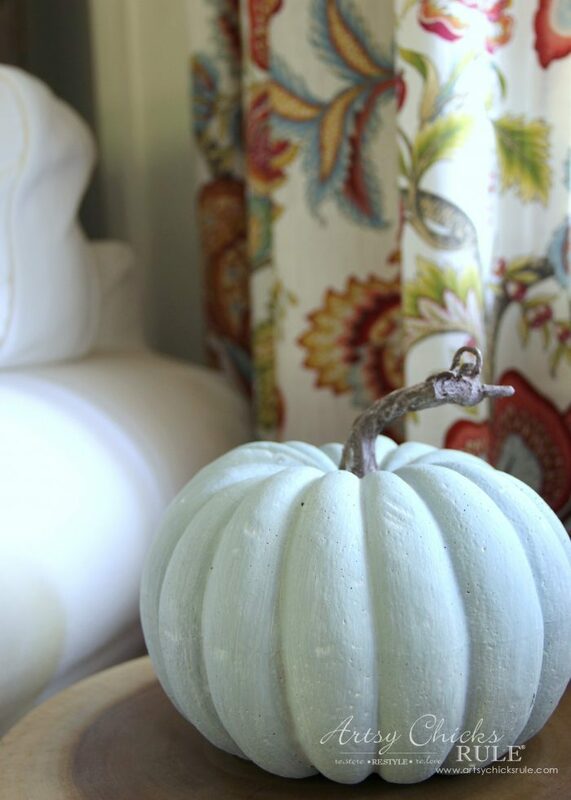 Heirloom pumpkins with soft bluish grays too! Beautiful room, Nancy! 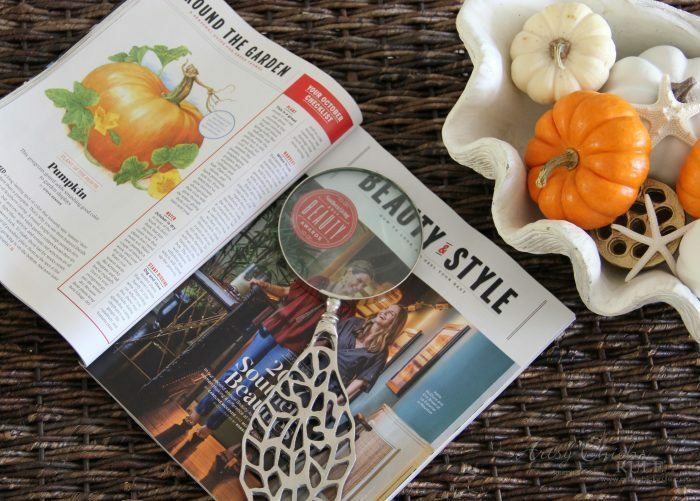 It brings in all the beauty of fall with a coastal touch! Now for some lovely fall like weather! I back-tracked to your curtain “How-To”, and it was so helpful, as were all the photos. I just bought a very similar fabric for my new home and then of course stood and looked at it and wondered just what I thought I was going to do with it, in a sweaty panic. Then up comes your site on Facebook, and all of a sudden, I have direction, and a plan, and the panic is gone. Thank you! 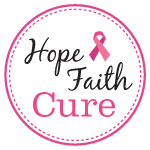 Such a fun blog hop! 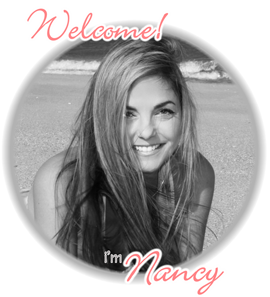 Thanks for sharing, Nancy! Your home looks lovely!